How Does God Guide Us? is a chapter from Nicky Gumbel's book, Questions of Life, and the seventh talk on Alpha. 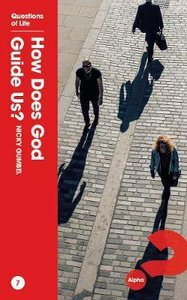 Nicky Gumbel examines how we can follow in God's will and direction for our life. This booklet may be given to a guest who missed this Alpha talk. About "Alpha Qol: How Does God Guide Us? (Questions Of Life Chapter Series)"